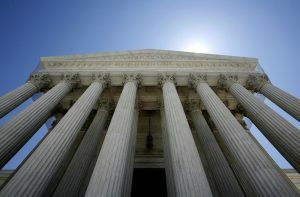 WASHINGTON — The Supreme Court ruled Monday that a lawyer for a criminal defendant cannot override his client’s wish to maintain his innocence at trial, even if the lawyer’s aim is to avoid a death sentence. The justices voted 6-3 in favor of Louisiana death row inmate Robert McCoy. He repeatedly objected to his lawyer’s decision to acknowledge that McCoy killed the son, mother and step-father of his estranged wife in 2008. Lawyer Larry English said the evidence of McCoy’s guilt was overwhelming. English said his strategy was to seek a sentence of life in prison instead of death. But jurors sentenced McCoy to death anyway. Justice Ruth Bader Ginsburg, writing for the court, said McCoy must be given a new trial. “Even when a criminal defendant is assisted by counsel, some decisions are reserved for the client,” Ginsburg said in a summary of her opinion. That includes the decision about whether to assert innocence, she said. Justices Samuel Alito, Neil Gorsuch and Clarence Thomas dissented. While English admitted that McCoy killed the victims, he did not concede that his client was guilty of first-degree murder, Alito wrote in his dissent for the three justices. Overwhelming evidence implicated McCoy in the killings, Alito said. “If petitioner is retried, it will be interesting to see what petitioner’s current counsel … will do,” Alito said. Among the evidence was a gun found in the vehicle in which McCoy was riding at the time of his arrest in Idaho that was linked to cartridge casings found at the scene of the killings in Louisiana. McCoy testified in his own defense, saying he was innocent and suggesting that a drug trafficking ring led by law enforcement officers had framed him for the killings. He tried to recruit witnesses he said would vouch for him, including then-Sen. David Vitter. Vitter said he did not know McCoy. The trial court found McCoy was competent to stand trial. English, the trial lawyer, argued consistently that McCoy was in a fragile emotional state and that he lacked the intent to kill that is necessary for a jury to impose the death penalty. English’s view of McCoy’s chances led him to concede in his opening argument that McCoy “committed these crimes.” McCoy had told English not to do that.